The Gel Band Patella Strap focuses compression through a unique viscoelastic insert. Relieves pain from patella tendonitis, etc. Angle buckles keep the product's straps perfect aligned. Effective and comfortable for work and athletic activity. The Gel Band Patella Strap features a unique viscoelastic buttress that is designed to focus compression and relieve stress due to tendonitis. The insert is perfect for use right over the quadriceps or patella tendons in your knee. The Gel Band Patella Strap decreases stress to the tendon and improves patella tracking during walking or running. Two loop lock closures are used to apply a consistent tightness through the buttress. The buckles are angled slightly to help maintain the straps in a properly aligned direction. It is made out of durable materials for long lasting wear and is a one size fits all product. Simply apply the FLA Gel Band Patella Strap just below the bottom of your kneecap for easy and fast pain relief. Focuses compression through a viscoelastic gel insert. Decreases stress to the tendon and improves tracking of the patellofemoral joint. Features two loop lock closures to provide a perfect fit. Buckles are angled slightly to keep the straps properly aligned. Can be used on the patella tendon or the quadriceps. 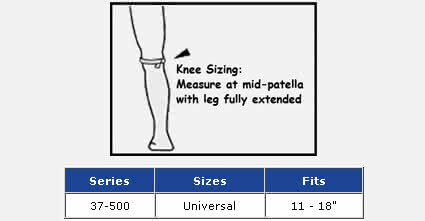 Universal size- Fits 11-13" knee circumference. Not 2-3 year old or previously used/returned merchandise as seen on other 3rd party sites - all new stock. I have chondromalacia and it has always been a painful issue for me with walking, running, and hiking. This is the first strap that actually worked for me and made my pain less. Just bought a replacement for my other one that wore out finally after 5 years. They hold up well. This gel strap stays in place and has a two velcro straps that you pull to tighten it around your knee. Works great for me. Didn't help me knee. It does seem to be well made though. Very good - has reduced the pain by 60% around my kneecap. I don't have any pain when I'm going down stairs now. Helps my pain Review by Tina D.
I tried some other straps with little benefit. This strap's gel pad has done a very good job of reducing the pain I had around my kneecap. FLA Orthopedics believes that the best way for you to select and purchase a FLA Orthopedics brace is at one of its authorized online stores of which DME-Direct is one. Only in these stores can you be sure to find the latest FLA Orthopedics collection and ensure you are getting a genuine FLA Orthopedics product with the manufacturer's full warranty. FLA Orthopedics therefore recommends that you do not purchase a FLA Orthopedics item through any website, unless it is an authorized FLA Orthopedics dealer. We are a FLA Orthopedics Authorized Dealer and can assure you a safe and pleasant shopping experience here at our website as if you were at our wholesale distribution premises in Valencia, California. Some non-authorized sites sell counterfeit, second-hand merchandise, and/or products containing old fabrics, glues, and resins that do not perform as intended, and are therefore, not eligible for care under the FLA Orthopedics warranty. Others do not offer the original FLA Orthopedics warranty, nor do they offer any after-sales service of any kind. FLA Orthopedics takes great care to ensure that all FLA Orthopedics authorized dealers offer you the very best products and service. Please take advantage of the peace of mind that only they can offer to FLA Orthopedics purchasers.